Mayor Rahm Emanuel and Governor-Elect JB Pritzker both reacted to yesterday's news about agents searching Alderman Ed Burke's office. NBC 5's Mary Ann Ahern has the latest. Four candidates have filed to run against Ald. Ed Burke — it was already shaping up to be a tough fight for the dean of the City Council. 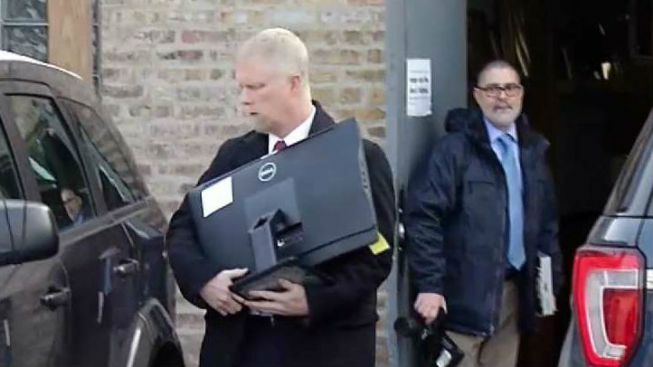 The brown paper— taped up by investigators Thursday — was down Friday and staffers are back at Burke’s City Hall office -- but with law enforcement removing computers, how are they able to prepare for the December council meeting? The finance committee -- approves bond deals, housing related agreements and police settlements. "It's obviously significant but you have a lot of questions, I have a lot of questions, what I don't do is literally play guess work on this," Mayor Rahm Emanuel said. Burke says he’s a survivor. "I've been involved in previous investigations, I've always cooperated, nothing has ever come of any of those investigations, I'll fully cooperate in this one," he said. The mayor is asked if Burke should step down as the finance chairman. "It's not even been 24 hours," Emanuel said. "It's too quick to jump to anything in that effort." WVON radio host and former alderman Cliff Kelly— who was convicted of corruption charges in 1987 said he’d rather not weigh in on the Burke investigation. However, Cook County Clerk David Orr, who also served as an alderman reacts. "It's the traditional ... machine politics that's still around some that's made this city less than it could be," he said. With this new federal investigation — hanging over Burke into his re-election -- Governor-elect J.B. Pritzker notes the correlation between Burke and the tax work he's done on Chicago's Trump Tower. "There was the Cohen plea, nationally, there was something going on with Deutsche Bank--which I know is an owner of the debt anyway around the Trump Tower," he said. "I really don't know what the purpose of that was." So while the guessing game continues -- next week Burke holds his annual holiday party which is also a fundraiser -- the question is -- will his many friends show up?